Sauce:2 c. ketchup1 c. brown sugar1/4 tsp. garlic powder1 medium onion Mix together until all ingredients are blended in a large container. Shape into walnut-size balls. Line bottom of a 13 x 9 x 2-inch pan with foil and place meatballs inside. 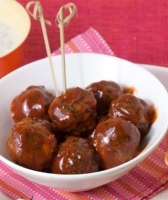 Barbecue Sauce: Mix together ketchup, brown sugar, garlic powder and onion. 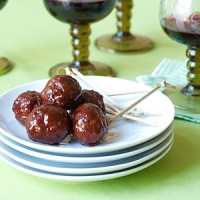 Pour sauce over meatballs and bake at 350° for one hour. 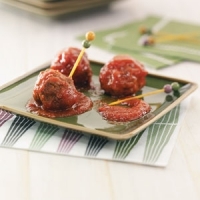 Recipe categories: Appetizers, Ground beef, Beef.